Many N64 games have a “blurry” look to them, due to the way Nintendo designed the console. Luckily, people have discovered ways to remove some of the filters using both hardware and software. This page is a culmination of work done by many different people in the retro gaming community; I’m not trying to take credit for any of these amazing finds, I just wanted to archive it all in one place. The picture below is a result of their work and the improvements that can be made in these games (click the picture for a full-sized view). Also, see the video next to it from My Life In Gaming that does an excellent job explaining everything! Describing how the N64 gets its “blur” is a bit complicated and involves both hardware and software, but I’ll try to simplify the explanation as best as I can. First, there’s basic anti-aliasing, which “smooths” the image. In the game Quake, developers actually added an option to disable this filter in the video options, where its simply called “filter”. The fact that the option exists at all led game hackers to figure out how exactly to turn that software filter off using gameshark codes (or patched roms). 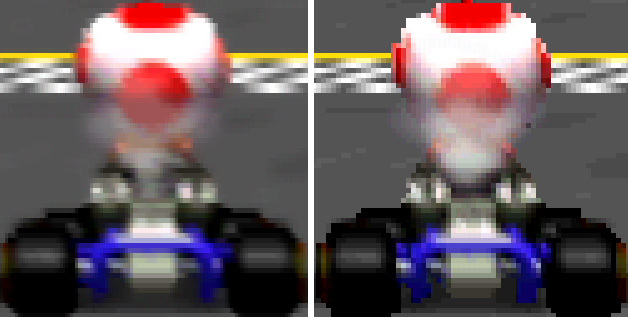 The N64 hardware itself ads a horizontal blur feature that also softens the image, which is completely different from the blur discussed above. The UltraHDMI kit has a feature to remove this filter and there are talks of a hardware add-on to remove this from RGB-output as well. I’ll add more information on the RGB add-on as it becomes available, but for now, the only way to perform a hardware de-blur is via the UltraHDMI. Simply enable the ‘VI De-Blur’ option in the advanced menu. These patches are something every N64 fan should try; Not everyone will prefer them to the original look, but I think everyone will agree it was worth trying! Well, that’s it! Feel free to go back to the main N64 page. If you’d like info on mods for other systems, head to the Getting RGB From Each System page or check out the main page for more retro-awesomeness. Complete Nintendo 64 Console (NTSC) With Cords. Controller. Free Game.